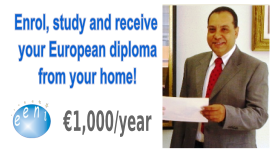 Syllabus of the Online Course (Subject): International Bonds and Guarantees. Documentary Collections. In this part, we will explore export finance products that are growing rapidly. We will explore Factoring, Invoice Discounting, and work through the procedure for a Forfeiting transaction. Objective: Gain a good understanding of Forfeiting, Factoring, and Invoice Discounting. The objective of this part is to understand what Documentary collections are and how they work. Export and import Collections will be analysed. 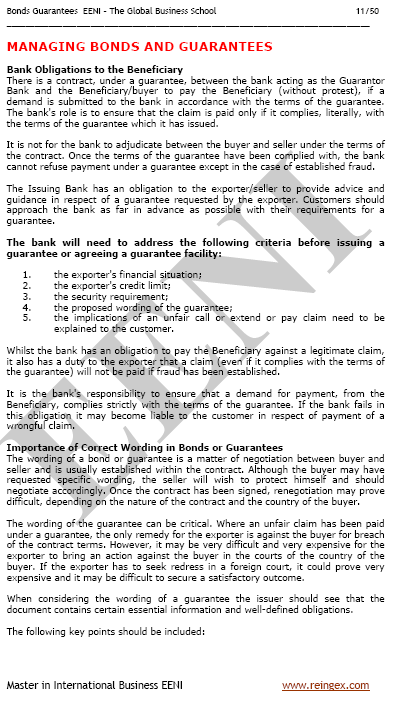 An overseas guarantee or bond is a written undertaking by a Bank to a foreign party that the Bank will pay a sum of money against a written demand for payment or submission of a document (or documents) stipulated in the guarantee document itself, upon the occurrence of a specified event or events. The words “guarantee” and “bond” are interchangeable, and no particular relevance is attached to the use of either of these terms. The importer requests a tender bond when tenders or quotations are invited from sellers/exporters for product purchase or manufacture or project management. The outcome of a successful tender is the award of a contract and some cases, the eventual submission of a performance bond or guarantee. The conditions of a performance bond or guarantee are sometimes stipulated in a letter of credit opened by an importer in favour for the exporter. In such cases, the letter of credit (LC) does not become operative until the performance guarantee is established in favour to the importer. The International Chamber of Commerce first published the Uniform Rules for Contract Guarantees (ICC Publication No. 325) in 1978. The rules are intended to regulate the guarantees and cover tender bonds, performance guarantees and repayment guarantees given by banks, insurance companies and other guarantors. Unlike the UCP 600 for Documentary Credits, the Guarantee Rules of the International Chamber of Commerce are not broadly used in Central Asia or other parts of the World. 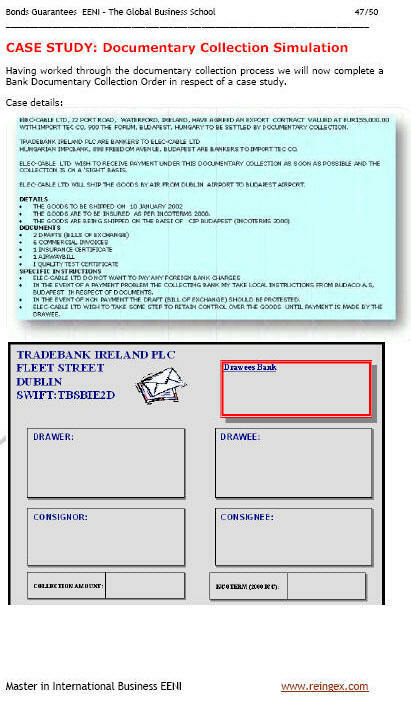 Collections are a service provided by banks to their export and import customers with the objective of payment collection under the structure and security of an internationally accepted body of rules known as URC 522 of the International Chamber of Commerce, Paris, France. Using collections, banks facilitate the settlement of payment between International importers and exporters. Collections offer a greater degree of security to the exporter than open account transactions.